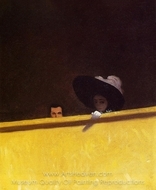 Felix Vallotton was a Swiss painter and graphic artist, an important figure in the development of the modern woodcut. He was born into a conservative middle class family in Lausanne, and there he attended Coll�ge Cantonal, graduating with a degree in classical studies in 1882. In that year he moved to Paris to study art under Jules Joseph Lefebvre and Gustave Boulanger at the Acad�mie Julian. 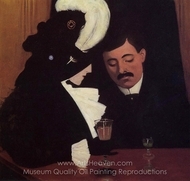 He spent many hours in the Louvre, where he greatly admired the works of Hans Holbein, Albrecht Durer and Jean Auguste Dominique Ingres; these artists would remain exemplars for Vallotton throughout his life. 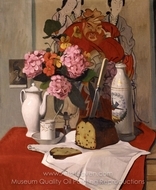 His earliest paintings, such as the Ingresque Portrait of Monsieur Ursenbach (1885), are firmly rooted in the academic tradition, and his self portrait The Painter at Twenty received an honorable mention at the Salon des artistes fran�ais in 1886. In the years that followed, Vallotton painted, wrote art criticism, made some prints and, in 1891, executed his first woodcut, a portrait of Paul Verlaine. 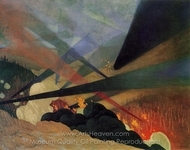 The many woodcuts he produced during the following decade, were widely disseminated in periodicals and books in Europe as well as in the United States, and were recognized as a revolutionary innovation in printmaking. 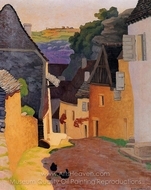 With these works Vallotton had transformed a medium that, in the western world, had long been utilized unimaginatively for commercial reproduction of paintings and, latterly, photographs. 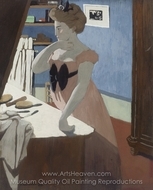 Vallotton's woodcut style eliminated halftones, translating reality into stark oppositions of massed black and white while emphasizing outline and pattern. 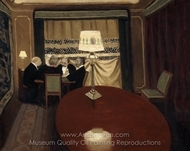 The influences of post-Impressionism, symbolism and the Japanese woodcut are apparent; a large exhibition of ukiyo-e prints had been presented at the �cole des Beaux-Arts in 1890, and Vallotton, like many artists of his era, collected these prints. 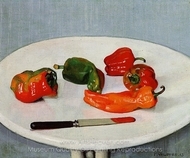 Around 1899 his printmaking activity diminished as he concentrated on painting, developing a sober, often bitter realism independently of the artistic mainstream. 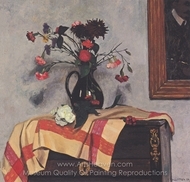 His Portrait of Gertrude Stein (1907) was painted as an apparent response to Picasso's portrait of the previous year, and in The Autobiography of Alice B. Toklas Stein described the very methodical way in which Vallotton painted it, working from top to bottom as if lowering a curtain across the canvas. 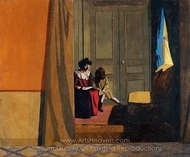 Vallotton's paintings in their severity prefigure the New Objectivity, and seem especially close to the work of Christian Schad. 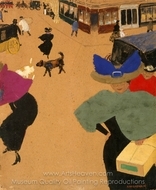 The public response was mixed; typical is the reaction of the critic in the March 23 1910 issue of Neue Z�rcher Zeitung who complained that Vallotton "paints like a policeman, like someone whose job it is to catch forms and colors. 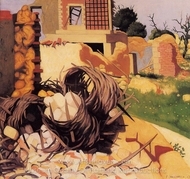 Everything creaks with an intolerable dryness...the colors lack all joyfulness." 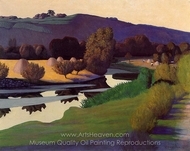 In his last years F�lix Vallotton concentrated especially on still lifes and on "composite landscapes", landscapes composed in the studio from memory and imagination. He died on the day after his 60th birthday, following cancer surgery in Paris in 1925.